When I reviewed Annick Goutal colognes recently, I mentioned that the trio would be great for those who are new to this fresh citrusy genre. The Hermès cologne collection would be my other recommendation. You can have a cologne flight starting from the champagne dryness of Eau d’Orange Verte and continuing with the white wine effervescence of Eau de Pamplemousse Rose. If you’re ready to try something more challenging, Eau de Gentiane Blanche offers a cocktail of green peppers and milky sap oozing from dandelions. With Eau de Narcisse Bleu and Eau de Mandarine Ambrée having recently joined the collection, you have even more interesting choices. The fragrances round out Hermès’s cologne offerings with the elegant interpretation of spring flowers and sweet citrus. Both fragrances are polished and refined in a way that is typical of most fragrances by Jean-Claude Ellena, and either would be equally suited to both men and women. As Hermès’s in-house perfumer, Ellena has a rare luxury in today’s fragrance industry of working as perfumers did in the days past–selecting high-grade raw materials, devising scents based on his ideas rather than an impersonal client brief and working closely with the fashion house and its designers. As a result, his fragrances have an immediately obvious fingerprint. To detractors, his etudes are too evanescent and are now increasingly familiar, but to the fans of Hermès (and Ellena’s) style, it’s the attention to detail and quality that are so refreshing in today’s world of mass produced luxury. Eau de Narcisse Bleu is the most recognizable theme from Ellena which we’ve smelled before in Hermessence Paprika Brasil, Eau de Gentiane Blanche, and Bulgari Eau Parfumée au Thé Vert. But in this case, I don’t mind encountering the familiar faces (or notes, if you will), because I can’t get enough of anything green. “We want… a shrubbery!” I quote the Head Knight from Monty Python. And Eau de Narcisse Bleu delivers plenty of foliage. 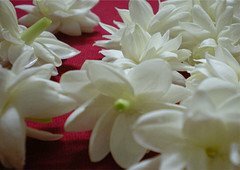 It has a bright top note of green leaves, lemon slices and violet petals, smelling like a freshly tossed salad. Then the iris and orange blossom become more pronounced softening the dark green to chartreuse. As the soft woods and musks fill out the drydown, Eau de Narcisse Bleu turns more wistful. My idiosyncratic preferences for greens aside, I enjoy this cologne for its graceful character. It smells like spring itself–the cool sweetness of daffodils, the musky richness of rain-soaked earth, the tangy bitterness of young leaves, but it’s tender and mild. I see myself wearing it all year round, as a perfume equivalent of a crisp white shirt. It’s a perfect daytime fragrance that won’t offend anyone, while keeping you entertained. I had a more difficult time with Eau de Mandarine Ambrée, although admittedly it’s an intriguing composition. At first, it’s a juicy mandarin orange, combining the sweetness of its flesh and the bitterness of its rind. There is also a sharp tropical fruit note–guava or passion fruit–that gives Eau de Mandarine Ambrée an unexpectedly exotic twist. The sweet amber and vanilla peak through the fruity layers, and as the perfume dries down, it makes me think of a cross between the bitter grapefruit of Guerlain Aqua Allegoria Pamplelune and the powdery vanilla of Shalimar. What I found less appealing was the bitter, almost sulphuric sharpness that reminds me of grapefruit flavored candy. So, please try it on skin first and give it a thorough test. Those of us exasperated with the brief longevity of Hermessence fragrances but like the sheer scents, will enjoy the moderate tenacity of both Eau de Narcisse Bleu and Eau de Mandarine Ambrée. (I would recommend at least 3-4 generous sprays.) Their sillage, on the other hand, is excellent. 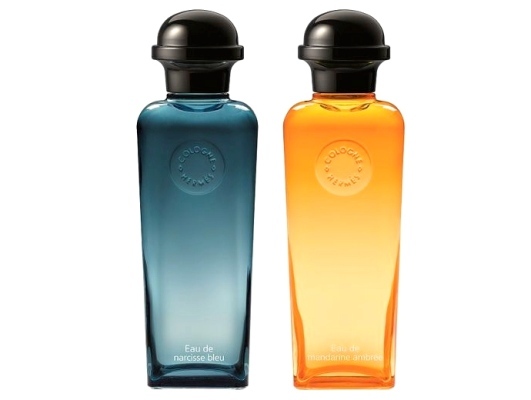 Hermès Eau de Narcisse Bleu and Eau de Mandarine Ambrée Eau de Toilette are available in 100ml ($125) and 200 ml ($165) spray bottles. Sold at Hermès boutiques, counters, and online at hermes.com. Lucas: Thank you Victoria for bringing us the review of two new Hermes Colognes. Victoria: I would love those 15ml travel sizes too, but since I wrote my review over the weekend, I returned yesterday to the boutique and bought a bottle of Eau de Narcisse Bleu as a gift for my husband. (I do plan on stealing some from his bottle time to time). The Blue Squid: The salad green you describe sounds tasty, but kind of unsettling. Are you sure it is not the advance guard of some sort of terrible alien invasion? maja: I totally get all the criticism surrounding Ellena’s work and sometimes participate in it. But nevertheless my used up bottles are all Hermes in the end. Maybe because of their clearly unisex character ( I share most of them with my husband). Eau de Narcisse Bleu sounds like something I would enjoy. Cant’ get enough of anything green, too and can’t wait to try it. Victoria: “Bring me another shrubbery!” I love this Monty Python scene too, and it always makes me laugh. Leathermountain: Indeed, I would rather gripe about the price than the evanescence. I don’t fully understand perfume economics, but I’ve read that fashion houses turn a high percentage of their profit from fragrance. Is that true? I don’t really want to underwrite leather goods and clothes that don’t come in my size. Perfume exists in the temporal medium. I don’t want permanent perfume any more than I want perfume that evaporates before I can smell it. For me, anything in between is fair game, part of the specific character of a composition. Regarding Ellena’s recognizable style: first I will admit that Voyage did strike me as a least-common-denominator of many of his other fragrances. That said, I think that exploring an idea from every angle is a legitimate approach to creative work. The polar opposite would be different for different’s sake — on the whole, perhaps less likely to generate greatness. I suppose I’m repeating my thought about time here: subtle variations, huge stylistic leaps, it’s all fair game to me. In any case I’d like to evaluate each work on its own terms. So far, maybe apart from Voyage, I have yet to smell an Ellena that wasn’t worth experiencing. Austenfan: My favourite bits of Holy Grail are the French Taunting and the discussion about swallows, coconuts and whether or not swallows or coconuts are migratory. Thanks for reminding me of that bit of British absurdity! Victoria: I also love “It’s just a flesh wound.” That whole movie is full of such absurd, as you well put it, snippets, but they are so hysterical. Austenfan: I should get a bottle of Pamplelune, I just get this wonderful grapefruity rose. Is it too sulphuric to you? OperaFan: I came to Monty Python late, but the husband can quote the entire Holy Grail movie script from start to finish, and of course, we HAD to see Spamalot on B’way! I am a huge fan of Ellena’s style, in fact, I’d probably state that he is my favorite contemporary perfumer. I love the paleness, the tranquility, the intraverted and unisex nature of his work. It’s sort of an olfactory portrait of myself, an olfactiry expression of who I am. Really, if I had my own personal perfumer, I would ask him to create exactly these kinds of fragrances. I hope JCE’s career will continue blossoming for years to come. I’ve been hoping to see your review ever since word surfaced about Eau de Narcisse Bleu and Eau de Mandarine Ambrée! I really enjoy Hermès fragrances — and these florals / citruses sound right up my alley. I will have to do my best to seek them out! Victoria: They also had Eau D’Orange Douce as a limited edition a few years ago, and it was very nice. But I don’t miss it too much now that it’s gone, especially when there are so many other great orange scented choices. Beth: Victoria, I always enjoy (and dread) reading your reviews. Dread because my sample list at STC is getting out of control. This one is especially bad because lately I’ve been going note/theme crazy. I just finished ordering 10 oud scent samples last month and now I’m curious about greens. I’ve been challenging myself to try a genre/note that I’d previously said “nope, don’t like that” without a whole lot of exploration. So your shrubbery comment had me giggling, then going ‘hmmmmmm’. Victoria: Bravo for testing your boundaries this way, Beth! Overdoing those sample orders can be dangerous, but even if you smell a couple of new challenging perfumes every now and then, it will already be fun. carole macleod: These sound just beautiful! I wonder if the Narcisse has a good narcissus note-I love original Je Reviens, for the narcissus note. Never found anything that compares to that particular note, for me. I love Gentiane Blanc. And oddly enough i have worn the Pamplelune fragrance with Shalimar-one on wrists, the other on ankles. It was a good experience to be covered in head to toe Guerlain but I liked both fragrances on their own rather than mixed. I cannot wait to try them-thank you for sharing this news, on a lovely spring day! Victoria: I wanted to add that Eau de Narcisse Bleu on the whole is quite soft, rather than sharply green, but when you get up close, you notice its spring-like, green notes. perfumekev: I can’t wait to try these. I really loved the Gentian Blanc. Then agian I really havent found a Jean Claude Ellena fragrance -begining with Eau de Campagne , to Jour that hasn’t worked for me. Like many others I find my self buying refill bottles since my partner and I wear them very often. I have also had to gift a few to friends who fall in love with one of his perfumes. Victoria: You said it so well! Un Jardin Sur le Nil and Un Jardin en Mediterranee (and not Hermes, but Bulgari Eau Parfumee au The Vert) are the perfumes I usually recommend to my friends. My husband is already on his second bottle of Eau Parfumee au The Vert, and I just love the way it smells on him. Emma M: I’ve yet to find one of the Hermes cologne series that’s really ‘me’ – I find them nicely done, but just not that exciting. Disappointing, as I do admire Ellena and like the Hermes line. Victoria: Dionne, don’t get me started with quoting Monty Python! 🙂 I love them!